SUBHEAD: The belief in Human Supremacy is morally indefensible and destroys our planet. Image above: Researcher Walter Tschinkel uses molten metal to make casts of intricate harvester ant nests. And it was not just once. It was many times. 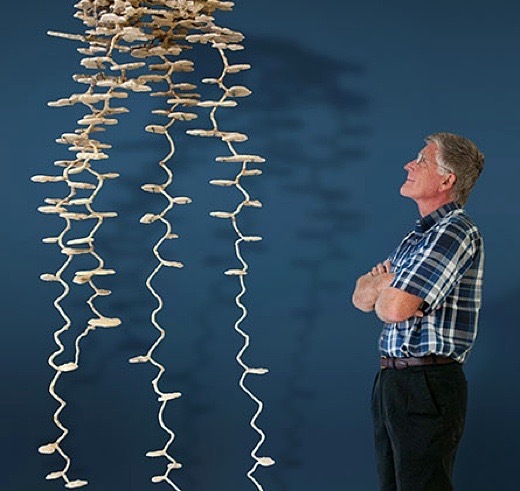 From (https://www.sciencenews.org/article/harvester-ants-are-restless-enigmatic-architects). Someday I am going to die. Someday so are you. Someday both you and I will feed—even more than we do now, through our sloughed skin, through our excretions, through other means—those communities who now feed us. And right now, amidst all this beauty, all this life, all these others—sedge, willow, dragonfly, redwood, spider, soil, water, sky, wind, clouds—it seems not only ungenerous, but ungrateful to begrudge the present and future gift of my own life to these others without whom neither I nor this place would be who we are, without whom neither I nor this place would even be. Last year someone from Nature [sic] online journal interviewed me by phone. I include the sic because the journal has far more to do with promoting human supremacism—the belief that humans are separate from and superior to everyone else on the planet—than it has to do with the real world. Human supremacism is killing the planet. Human supremacists—at this point, almost everyone in this culture—have shown time and again that the maintenance of their belief in their own superiority, and the entitlement that springs from this belief, are more important to them than the well-being or existences of everyone else. Indeed, they’ve shown that the maintenance of this self-perception and entitlement are more important than the continuation of life on the planet. The first line of defense of human supremacism is no defense at all, literally. This is true for most forms of supremacism, as unquestioned assumptions form the most common base for any form of bigotry: Of course humans (men, whites, the civilized) are superior, why do you ask? Or more precisely: How could you possibly ask? Or even more precisely: What the hell are you talking about, you crazy person? Or more precisely yet, an awkward silence while everyone politely forgets you said anything at all. Think about it: if you were on a bus or in a shopping mall or in a church or in the halls of Congress, and you asked the people around you if they think humans are more intelligent than or are otherwise superior to cows or willows or rivers or mushrooms or stones (“stupid as a box of rocks”), what do you think people would answer? If you said to them that trees told you they don’t want to be cut down and made into 2x4s, what would happen to your credibility? Contrast that with the credibility given to those who state publicly that you can have infinite economic (or human population) growth on a finite planet, or who argue that the world consists of resources to be exploited. If you said to people in this culture that oceans don’t want to be murdered, would these humans listen? If you said that prairie dogs are in no way inferior to (or less intelligent than) humans, and you said this specifically to those humans who have passed laws requiring landowners to kill prairie dogs, would they be more likely to laugh at you or agree with you? Or do you think they’d be more likely to get mad at you? And just think how mad they’d get if you told them that land doesn’t want to be owned (most especially by them). If you told them there was a choice between electricity from dams and the continued existence of salmon, lampreys, sturgeon, and mussels, which would they choose? Why? What are they already choosing? Right now the University of Michigan Wolverines football team is hosting the Minnesota Golden Gophers. More than 100,000 humans are attending this football game. More than 100,000 humans have attended every Michigan home football game since 1975. There used to be real wolverines in Michigan. One was sighted there in 2004, the first time in 200 years. That wolverine died in 2010. I just got a note from a friend who was visiting her son. She writes, “Yesterday morning when I emptied the compost bucket, the guy next door called out to ask if that was ‘garbage’ I was putting on the pile. I told him it was ‘compost.’ We went back and forth a couple of times. Given what the ideology of human supremacism does to people who otherwise seem sane, we shouldn’t be surprised to learn that the scientists wanted to find out what would happen if they surgically deafened these mice. And we shouldn’t be surprised to learn that the mice could no longer sing their operas, their love songs. The deafened mice could no longer sing at all. Instead, they screamed. Or there’s this. Just yesterday I spoke with Con Slobodchikoff, who has been studying prairie dog language for more than thirty years. Through observing prairie dogs non-intrusively in the field, he has learned of the complexity of their language and social lives. But he has done so, he said, without the aid of grants. Time and again he was told that if he wanted to receive money for his research—and if he wanted to do “real science” instead of “just” observing nature—he would have to capture some prairie dogs, deafen them, and then see how these social creatures with their complex auditory language and communal relationships responded to their loss of hearing. Of course he refused. Of course he didn’t receive the grants. And then today I got an email from a botanist friend who has worked for various federal agencies. His work has included identifying previously unknown species of plants. He said this work has not been supported by the agencies, because the existence of rare plants would interfere with their management plans, including the mass spraying of herbicides. His discoveries have been made on his own time and on his own dime. My botanist friend agreed. “Science makes it very hard to love the world. Most scientists want the world to fit nice, clear, linear equations, and anything that doesn’t fit is ignored, unless you can get a publication out of it. Love isn’t a concept that would even come to mind concerning the natural world. The natural world is just a means to an end. A thing to be dissected, so they can get tenure. I was talking to a local botany professor, about how geology can drive speciation/change, and he was actually surprised to consider anything outside of genetic mechanisms. I was surprised at his surprise: his view just seemed so limited. Or there’s this. The air around the world has recently been declared to be as carcinogenic as secondhand smoke. The leading cause of lung cancer is now industrial pollution.